Throughout our travels, we often came across people who have made travelling their LIFE – they have been travelling for years and years. They don’t ever want to go home. The world is their home. I was intrigued, how can they afford it? So instead of going home after 7 months of travelling, we decided to apply for an Australian working holiday visa and go for it too. We weren’t anywhere near ready to go home yet, plus we hoped to make enough money for more months of travelling. We decided to fly to the wonderful city of Brisbane, Queensland. On the basis that it seemed cheaper to live in than Sydney and Melbourne, and we didn’t fancy working on a farm. We were actually so excited to stop and work in a place for a bit, that on our first day we set up bank accounts, bought a phone, went to the library and created a CV and started applying for jobs. We even joined a gym. My excitement for the new life in a new country lasted about a month before I was longing to be back in Asia, travelling, I even missed England a little bit! A feeling I had never had before. I worked more jobs in 5 months in Australia than I had ever had in England in my life. I worked some hard commission-based sales jobs that I would never have believed myself confident enough to do. But I did it. I also had jobs working at farmers markets in the countryside, in photography, and a waitress job in a cafe. I had to get up so early for some of these jobs that I used to walk almost an hour alone in the dark at 4am to the train station as the public transport wasn’t running that early. I would constabtly be on ‘gumtree’ – searching for new jobs advertised for backpackers. We had a nice house which we rented with great house mates. And Brisbane was beautiful, a city built so perfectly. When I wasn’t working, I would be sunbathing by the river, swimming in the lagoon, enjoying the perfect weather, or having BBQs in the park. It was a perfect city to live in. But still, I sometimes found myself counting down the weeks until it was time to leave and be back on the road again. Even though I worked a total of 6 jobs over the 4-5 months I lived there, I only managed to save enough for 3 weeks travelling in Asia. So, what did we do so wrong? We only stayed for 4 and a half months in Australia. If we had stuck at it for longer I believe we could have saved more money, as starting out somewhere new is never easy and always takes TIME. We arrived in Australia with practically no money. It wasn’t a nice experience walking around such a beautiful city; past so many amazing restaurants, having to walk past knowing you’re going home for noodles once again. We ended up having to borrow money to get us started in our first month, then of course we all had to pay it back later. So remember, make sure you have enough money to get you started. I got myself in a bad mind space. I started to struggle to make sales in my commission based jobs, which made me feel more negative. So did having no money, and it made me miss my family back home. If I had managed to remain positive and grateful for the opportunity to be living and working in Australia, then I’m sure it would have been easier. Either way, one thing I want to make clear is that I don’t regret going at all. I look back fondly on my time living in Brisbane. I’m looking to go to Australia next year to work. I was also thinking Brisbane. 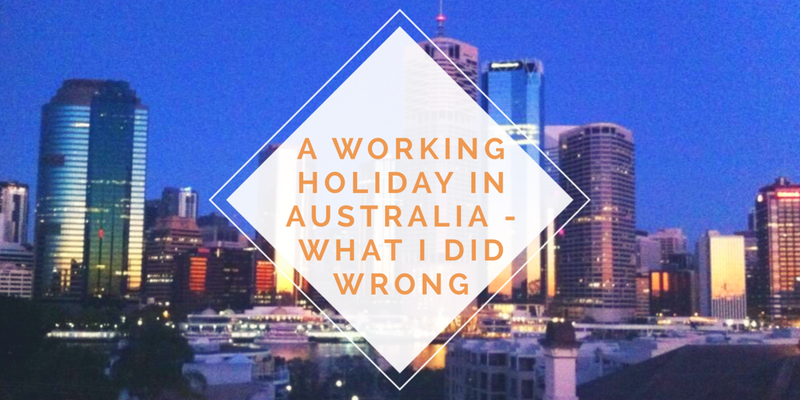 Do you know anything about admin/office roles in Oz – are they hard to come by for people on working holiday visas? Hey, thanks for your comment! 🙂 Yeah with so many backpackers in Aus it makes it hard to find work! Very true about the 6 month thing! Where abouts did you work in Aus? I can totally relate to this post! I also only spent 4.5 months in Oz and also had a hard sales job that I hated. My time in Australia (other than my Great Ocean Road trip) wasn’t pleasant, but I’m hoping that someday I’ll get to have a second chance with Australia. It really is an amazing country and there’s so much still to see and do. You’re doing a great job here and your blogdesign looks amazing!